Hello and welcome to the new HYIPsTalk.com Forum! We decided to switch from vBulletin to XenForo. In this upgrade process I also removed a ton of spam and old topics. If you see spam please use the Report link available on each post. From now on there will always be a moderator present on the forum. If you have any problems or questions you may start a conversation with user hyipstalk. Discussion in 'HYIP Discussion' started by All-HYIPs.info, Mar 18, 2019. The company Bit-ICO was founded back in 2015 by a group of engineers. At that time, Bitcoin cost only $270 and it had already experienced its first rise. Nobody ever thought that it would cost 20 thousand. 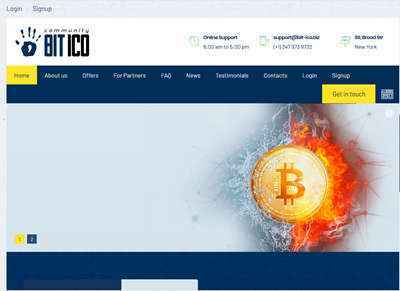 Our company specializes in mining, day trading and short-term investments in ICO. We earned really a lot in 2017 and successfully deployed our positions in 2018. Therefore, we paid our investors more than $13 million in November. Today it is the best time for new victories. Join our small but friendly family. вЂњBit-ICOвЂќ вЂ“ the road ahead. or 441% after 17 days Minimal 10 USD. Maximum 100 USD. or 358% after 23 days Minimal 100 USD. Maximum 50000 USD. 18.03.19 11:45 Transfer Sent Payment: 200.00 USD to account U18323410 from U1294xxx. Batch: 251427567. Memo: Shopping Cart Payment. Registrar TLD Registrar Solutions Ltd.
18.03.19 16:07;Account;Receive;Received Payment 14.91 USD from account U18323410 to account U1294000. Batch: 251480037. Memo: API Payment. The amount of 1.09 USD has been deposited to your account. Accounts: U18323410->U1187273. Memo: API Payment.. Date: 10:29 19.03.19. Batch: 251598615. The amount of 1.4 USD has been deposited to your account. Accounts: U18323410->U1136717. Memo: API Payment.. Date: 16:47 19.03.19. Batch: 251665429. 20.03.19 10:31 Received Payment 1.11 USD from account U18323410 to account U7051739. Batch: 251774628. Memo: API Payment. The amount of 1.32 USD has been deposited to your account. Accounts: U18323410->U1187273. Memo: API Payment.. Date: 15:55 20.03.19. Batch: 251826556. The amount of 1.57 USD has been deposited to your account. Accounts: U18323410->U1136717. Memo: API Payment.. Date: 19:47 20.03.19. Batch: 251856828. 19.03.19 17:07;Account;Receive;Received Payment 8.05 USD from account U18323410 to account U1294000. Batch: 251668170. Memo: API Payment. 19.03.19 03:58;Account;Receive;Received Payment 7.44 USD from account U18323410 to account U1294000. Batch: 251547177. Memo: API Payment. The amount of 1.18 USD has been deposited to your account. Accounts: U18323410->U1187273. Memo: API Payment.. Date: 17:43 21.03.19. Batch: 252014509. The amount of 1.4 USD has been deposited to your account. Accounts: U18323410->U1136717. Memo: API Payment.. Date: 20:35 21.03.19. Batch: 252033343. 21.03.19 04:14;Account;Receive;Received Payment 6.19 USD from account U18323410 to account U1294000. Batch: 251895391. Memo: API Payment. 20.03.19 18:20;Account;Receive;Received Payment 8.64 USD from account U18323410 to account U1294000. Batch: 251848696. Memo: API Payment. 20.03.19 04:07;Account;Receive;Received Payment 6.8 USD from account U18323410 to account U1294000. Batch: 251724407. Memo: API Payment. The amount of 1.04 USD has been deposited to your account. Accounts: U18323410->U1187273. Memo: API Payment.. Date: 17:24 22.03.19. Batch: 252183807.